Ever since he helped convince Hamid Karzai last week to agree to a run-off election, John Kerry has become a critical player on Afghanistan policy to a degree that's surprising even for a chairman of the Senate Foreign Relations Committee. Today, Kerry gave a speech on Afghanistan at the Council on Foreign Relations, in which he indicated that, while he thinks General McChrystal's counterinsurgency plan is too ambitious, he would support Obama sending some additional troops. A couple hours after the speech, in an interview with TNR, Kerry talked about how and why he believes Karzai has changed and what he considers his own role to be in working with the Obama administration. TNR: Are you at all confident that the November 7 election won’t be plagued by the same problems as the one held in August? John Kerry: I have no ability to be completely confident because I’m here, not there, and because there are a lot of moving parts. But I certainly believe it will be better and there will be much effort made to apply the lessons learned from the last one to the degree that they can in a short span of time. I’m also not a 100 percent certain that they’ll actually go to the full election; I think there’s still a chance that something might get worked through. But I have no inside information, I’m not predicting anything. ISAF and the election commission are preparing full-speed ahead and every effort is being made to get the ballots out and set up the mechanism: A bunch of election officials have been changed and they’re meeting regularly on the standards to make sure there’s an understanding there. You just have to work at it. We had a lot of problems in Florida and places in 2000, we had some more in 2004, so we’re still working at it. The Obama administration seems to have a fairly dim view of Karzai, at least as compared to how he was viewed by the Bush administration? Do you think the Obama people have been selling him short or misreading him in some way? I think that there’s a greater opportunity right now. I think there was a problem in the sort of mutual perception process that was taking place. I think he’s prepared to work effectively and to really buckle down and make things happen. I think he understands the challenge, he wants a strong relationship with us, he knows we have to partner effectively. And the test will be, if he’s elected—the election isn’t over yet, I don’t want to prejudge the outcome—so whoever’s elected, it’s going to be critical to work reforms into the government process and to make certain that we’re restoring people’s confidence that things can get done. If they can’t get done, it makes it unbelievably hard for our troops to be effective or to be perceived as anything except interlopers. If Karzai does win, what makes you confident he’ll tackle corruption in a way he hasn’t tackled it before? I think in the last months and in the leading up to the precipice of the last few days, he saw the downside of going down that road. My sense is that he has sort of rekindled his own enthusiasm and energy in trying to get some things done. This is what he told you? We talked a lot about the need for reform and the need for transition and he very much stated that he understood that, and I think it’s high on the agenda. Now saying something and following through on it are always two different things anywhere in the world. And so we’re going to have to set up a process where we’re really monitoring very closely, and working hand in hand. I don’t think it’s just monitoring. I just think we need to work cooperatively and where we run into a problem, we’ve got to be very direct with them. Are you going to judge Karzai's performance in terms of how he handles particular ministers, particular governors, and particular family members? Sure, absolutely, and I think we’ve talked very frankly about some of them. It would be inappropriate for me to do anything except raise questions, but I think the administration has every right in the world. If we’re going to have millions of dollars and troops and all that involved in their country, we have every right in the world to have a certain set of reciprocal expectations. If we don’t have a government we can work with, the biggest question mark of the parts of any strategy become even more questionable. Did your opinion of Karzai change after the time you spent with him on this last visit? You sound more optimistic about him than you have in the past. I think my understanding of him deepened. I’d spent a fair amount of time with him previously, but this was obviously much more intense, much more ingrained. I think he’s very smart and very deeply committed to his country and to our relationship and understands how difficult and challenging it’s going to be. So I think he knows he needs us and the international community in order to be successful. I think my appreciation for his aspirations for the country itself were impacted. I came away with a sense that this guy really has a vision, he cares about the country enormously. He just has a lot of pressure on him and different interests that he has to work through, and like any of us in public life, sometimes you hear one of those more than you hear the others. I think this election process has been a good check on him in terms of his own gut about where the country needs to go and what he needs to do to lead it there. 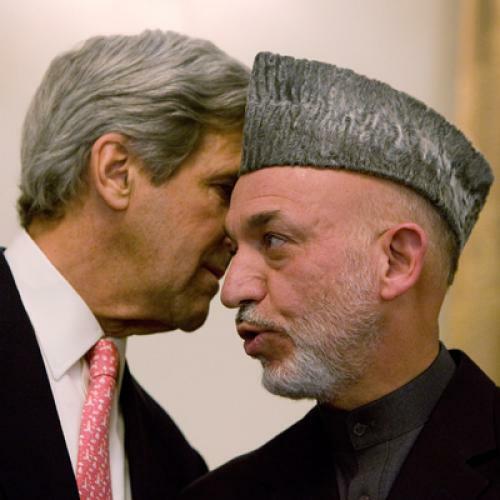 Do you see the possibility of some sort of reconciliation between Karzai and Abdullah? I don’t know, I can’t predict that. I tend to think probably not a reconciliation, but maybe an accommodation of some kind with respect to some issues and some agenda. I think Abdullah probably wants to take more of an oppositional role, I suspect. You don’t necessarily see him in any sort of government role? He’s been there before and who knows, but I’d probably guess not. You said in your CFR speech today that “we don’t have to control every hamlet and every village.” Is this more or less saying that the Taliban will never be permanently out of business in Afghanistan? No, I think the Taliban can be put permanently out of business but we don’t have to do it. Once we’ve developed an Afghan capacity, as the capacity develops, they may become completely obsolete in their own country. But we don’t have to do it. We only have to marginalize their ability to have an impact on stability and marginalize their capacity to threaten us with Al Qaeda. Those are the two key pieces. What’s your continuing role at this point? Just continuing as chair of the committee, that’s my role. But you don’t have to go back there? Oh, I will at some point. They’ve talked to me about possibly doing that at some point in time, we’ll see how things roll here. They being the Obama administration? Yes. Obviously we’re cooperative on this. We work as a team—where necessary or important and where we agree. Now, where we don’t, I’m an independent elected official with a constituency in my home state of Massachusetts, and I will continue to represent them.